I...no, WE (because hubs is totally part of the problem) have TOO MANY clothes. It's like they are multiplying on their own. Last year, we turned one of our extra rooms into a dressing room and converted our walk in closet to an office/jewelry making space. I like the added space and the ability to hang almost everything. That said, it's time for some purging! I decided to do a 5 things project where I get rid of 5 pieces each week until I have rid my life of things I don't wear anymore (and haven't worn in ages). Everything wearable will be donated. Someone needs them. To make it easy, I will set up a donation bin in the center of the dressing room. As we pull things, we can fold them and drop them in the bin. When the bin is full, off it goes to a local shelter we chose. Kind and clutter free all in one action. When we finish with the clothes, maybe we'll venture into other areas of the house...I have some pots that have seen much better days! For now, let me not get too ahead of myself. Focus = Clothes Purge. Here are the first 5 items being donated. 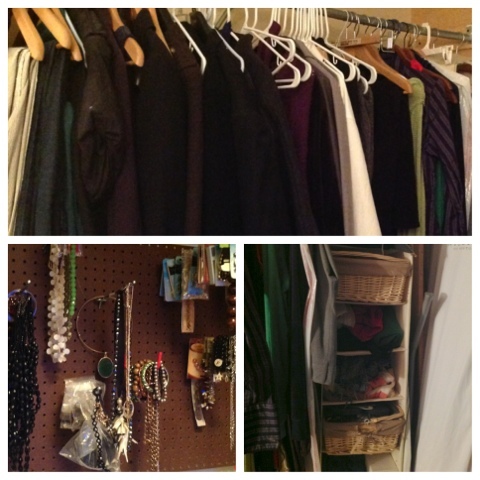 Do you have a hard time getting rid of things you don't wear anymore? If you've purged, what's your process?